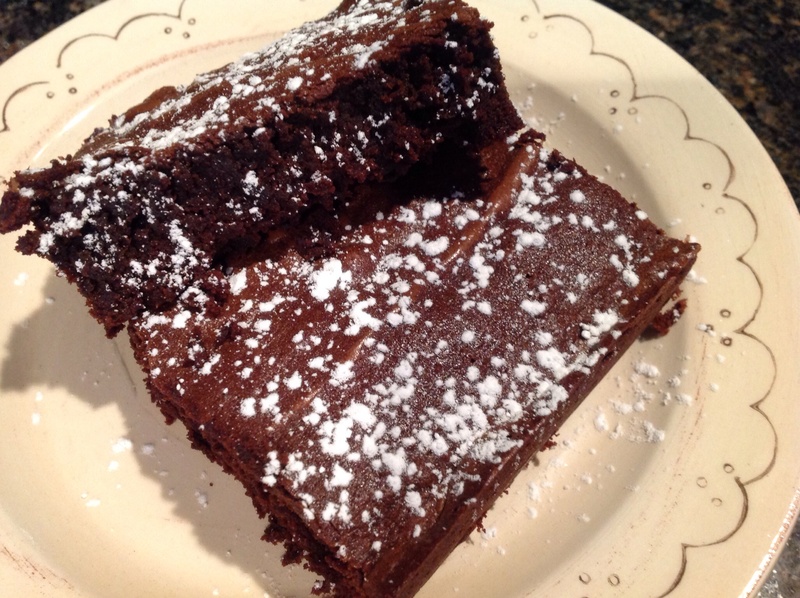 Posted December 8th, 2013 by Lisa & filed under 12 Divine Holiday Treats, brownies, chocolate, Christmas, Divine Chocolate. 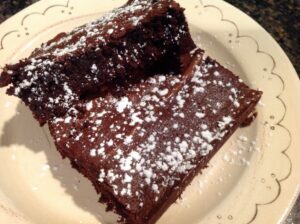 A holiday journey through the Divine Chocolate Cookbook would not be complete without a recipe for brownies, right? Well, far be it from TRB to disappoint. 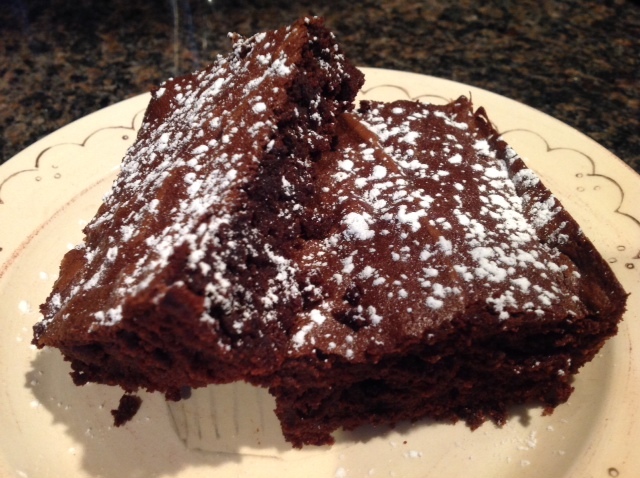 (Besides, it is National Brownie Day!) The next treat on our list is, indeed, Divine Brownies. And, boy, *are* they heavenly! You may recall that I’m very particular about brownies. In fact, I’ve tried time and again to achieve the perfect batch, but it sometimes proves elusive — too much flour, a high oven temperature and leaving them to bake too long are all classic mistakes. Truth be told, it’s tough to tell with the naked eye when brownies are actually “done” because, in reality, you want them to be a bit underdone. So.Much.Pressure. 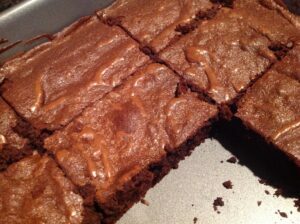 This recipe, however, yields the most wonderful rich and fudgy brownies I’ve had the pleasure of baking. A combination of melted Divine Dark Chocolate, butter, rich Divine Cocoa Powder and a minimal addition of flour makes these brownies so absolutely divine. There’s nothing cake-like about these bad boys! What’s more, brownies are such a versatile treat, especially at the holidays. You can serve them up with just a dusting of powdered sugar (as I did here) — get a bit more creative and use a cookie cutter to cut them into super festive shapes — or wrap them up in decorative boxes or individual bags for a special homemade gift anyone would be thrilled to receive. Go ahead and bake up a tray of these Divine Brownies. If you’re smart, you’ll leave one or two out for Santa, so he’ll be sure to take extra good care of you this year. 1. Preheat oven to 350 degrees. Grease an 8×8 baking pan and set aside. Break up the dark chocolate bars. Put into a heatproof bowl and melt gently (either in microwave or over a double boiler). 2. Remove the bowl from the heat and leave to cool until needed. Put the butter and sugar into a bowl and beat until fluffy. Gradually beat in the eggs, beating well after each addition. Beat in the vanilla extract. Spoon the cooled chocolate mixture into the butter and sugar mixture and combine. Sift the flour and the cocoa powder into the mixture and gently stir in. When completely combined, pour the mixture into the prepared pan and spread evenly. 3. Bake for 20-22 minutes — until firm to the touch, but still a bit fudgy. (The brownies will continue to cook for a few minutes after coming out of the oven). Let cool completely before cutting and serving. Don’t forget to enter for a chance to win a gift set from Divine Chocolate. Contest ends on Dec. 15. Learn more.